The name itself is cumbersome so now it is most often referred to as Nikkei Kai. The meaning of Nikkei is a North American of Japanese descent; kai means association. People are often surprised that such an organization exists in the Waterloo Region. This association was formed in 1984. It was decided that there was a need for an organization, especially for Japanese immigrant women as a support group. Most Japanese families did not have other relatives in the area from whom they might seek help. In the beginning we joined with the K-W Multi-Cultural Group and held our meetings at the Queen Street Centre. Within a few years it seemed that the interest of the Nikkei Kai membership did not share the same interests of the multi-cultural group so we disassociated ourselves from that organization. Thus, meetings were held one Sunday afternoon per month at members’ homes. The meetings included discussion of various topics of interest to the members, new ideas, craft workshops plus a social tea time with conversation mainly in Japanese. In January of each year, a New Year’s Potluck party was held. The first one was held at Victoria Park Pavilion in 1985. Subsequently, New Year Parties have been held at Albert McCormick Community Centre, and at churches, most recently at Waterloo North Mennonite Church. 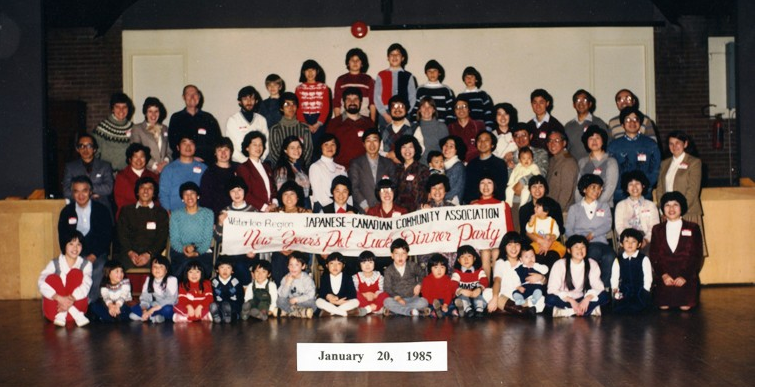 The interest for regular monthly meetings disappeared as children of families grew older and parents became busier in their own family lives and became less dependent on other members of the Japanese community. For many years, the only gathering has been the New Year’s Potluck. Picnics in the summer were attempted a few times. The 2009 Picnic was very successful. In the last few years there has been a change in the local Japanese community. There are many young families of a multi-cultural background, one part being Japanese. This has promoted a new energy and enthusiasm and interest to the Nikkei Kai. The New Year’s Potluck has an increase of young people and little children. There are more activities such as children’s storytelling in Japanese, karuta (Japanese word card game), workshops in food preparation, and crafts all dependent on the interest and request by members. Now the purpose of the association still mainly hopes to be a support group for the Japanese family members but also to nurture Japanese language and culture to the children of a multi-racial background and others who might be interested in Japanese culture.